I spent the day working on my beads in this very classic Humblebeads design. A friend recently asked me to revisit the bead in new patterns and so I jumped all over it! 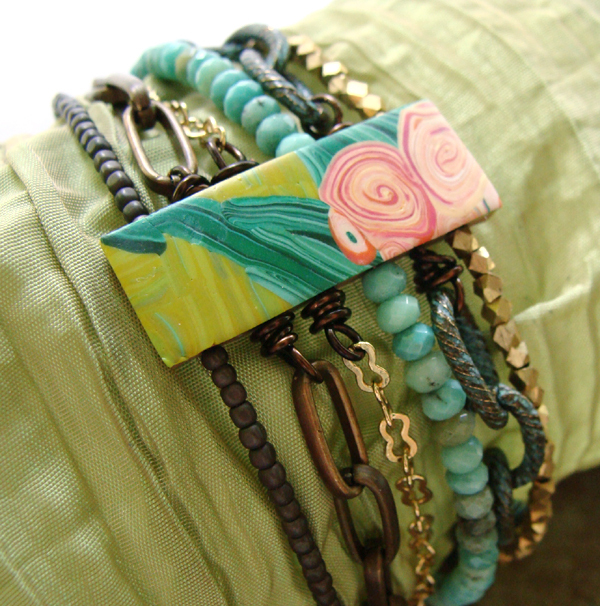 This bracelet features my Van Gogh Oleander 6-Hole Spacer Bead. I modified a bracelet design I did for BeadStyle magazine many years ago. This updated version pairs chain, metallic beads and faceted stones. The chains were attached using 20 gauge wire. Hint: start with the chains and then add the beads. On 3 1/2" of wire I created a loop 1 1/2" from the bottom. Open the loop and slide on the chain, close the loop and wrap to create a messy wrap. Slide through the bead and repeat on the other side. For the beads I cut 1 1/4" lengths of memory wire, strung it through the bead and taped one side so the wire was centered. I added beads on one side, created a loop with the memory wire to close and repeated the pattern on the other side. You can see on the back I used 20 gauge wire and 4mm fire polished glass beads to create spacers to stabilize the bracelet. The key to this design is mixing sizes and textures to create interest. This bracelet is so much fun to wear, whips up quickly and brings the party to your wrist! This is the original bracelet I created for BeadStyle magazine. You can find the directions online here. And check out this amazing necklace by Erin Prais-Hintz of Tesori Trovati. Erin always thinks outside the box and turned this spacer on it's side. Great minds think alike! Designer Lorelei Eurto also turned my Van Gogh Starry Night spacer bead sideways to create a beautiful focal with a copper pendant. This design was also featured in BeadStyle magazine way back in 2009. It still sparkles five years later, truly a classic! Gloria Ewing totally knocked my socks off with her Starry Night design cleverly featuring my 6-hole Spacer on the side of the necklace. I love this! Erin, Lorelei and Gloria's necklace are under their copyright, so I'm showing them for inspirational purposes only. But I'm sure they will get you thinking differently about this bead. Feel free to create either cuff bracelet design - but beware: when you wear them you will get showered with compliments! You can find my new cuff beads in Etsy shop and use code SUMMER25 for 25% off your order - last night of my summer sale!